It focuses on a minor character from the first film while essentially sidelining the expected main character. It doesn’t follow the same story pattern as the first film. It doesn’t even logically follow as a natural progression of the original’s story. Despite all of this, I can’t help but enjoy it immensely. I like it much more than the original Cars, though that’s not saying much. The only reason I give that movie a pass is because it’s the first film I ever saw in a theater with the girl who would become my wife. Cars 2 was a pleasant surprise. I avoided it for years because I had heard nothing but mixed to negative things about it. But when I finally sat down and watched the silly thing, I found myself immediately hooked. There’s just something about spy movies that makes them incredibly compelling to me. When done right, a la most James Bond movies and the original Bourne Identity, they have an air of self-confidence and cleverness that keeps me glued to my seat the whole time. And Cars 2 has that in spades. But I’m getting ahead of myself. Let’s break down exactly why Cars 2 didn’t break down for me. 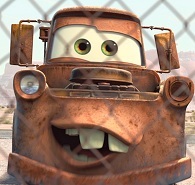 Mater plays a really strange role in the first Cars. He’s supposed to be Lightning McQueen’s anchor to the small-time mentality of Radiator Springs by becoming McQueen’s best friend overnight. But then there’s a really awkward moment when Sally soberly tells McQueen, “You know, Mater trusts you,” almost like Mater is a child or otherwise incapacitated to the point of perpetual innocence. That moment defined Mater’s character to me. He’s just a child who has no understanding of how the world works, and it’s up to McQueen not to hurt him in any way. That’s why I was so worried about Cars 2. A whole movie of Mater’s childish innocence? That sounds like a major pain parade. But it turned out to be nothing like what I expected. Mater is actually the most adult one in the room most of the time. He tries to be brutally honest with everyone about who he is and what he’s doing, but it’s all of the supposed smart cars who turn a blind eye to him. Plus, Mater is the main character of Cars 2 for a good reason. 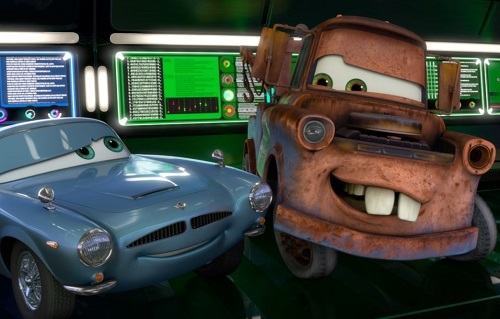 In the first film, Mater represents the rusty cars that McQueen despises having to advertise to for his Rust-eze sponsor. But in the sequel, he’s doing his best to protect McQueen against other broken-down lemons like himself who are envious of nice cars and want to destroy them. Mater never envied McQueen or tried to bring him down. He just saw him as a friend from the moment he first laid eyes on the racecar. So his speech at the end where he tries to convince the bad guys to change their ways actually holds some weight because he is the same as them, but he chose to see the world in a better way and he picked a brighter path as a result. McQueen was never terribly interesting as a character. Maybe that’s different in Cars 3. I haven’t seen that one yet. I don’t mind that he got put on the backburner for this film because Mater actually carries this film better than McQueen did the first one. Cars was all about Lightning McQueen learning to slow down in a small town and make friends instead of self-destructively attempting to win at any cost. So how in the world does it make sense for the follow-up to that film to be an international spy story? It doesn’t – at all. This complete lack of tonal continuity between films makes it feel less like a natural series of films and more like hodgepodge of random ideas. I mean, imagine if the sequel to Star Trek II: The Wrath of Khan was a baseball drama and the one after that was a time-travel comedy about saving the whales. It wouldn’t make any sense! Even though it shouldn’t be okay for Cars 2 to depart so drastically from its predecessor, it works purely because the first film wasn’t worth repeating. Cars is okay as a standalone film, but there was nothing else to do with that simple premise. It was boring enough the first time around. So I sort of respect the makers of Cars 2 for having the audacity to do something so insanely out of left field. Cars 2 takes a quasi-Empire Strikes Back mentality by splitting up the main characters and letting them go on separate but parallel adventures that eventually tie together at the end. But The Empire Strikes Back was at least a logical continuation of the story that started in Star Wars. It’s not like the Empire was suddenly replaced by some other looming threat. But that’s exactly what happens in Cars 2. Suddenly the sequel introduces a shadowy oil cartel intent on destroying environmentally friendly fuel options. There’s barely any precedent for this, except for a throwaway joke from the hippie Fillmore in the first film about a government conspiracy to cover up alternative fuels. I should be annoyed by this movie for having a typical misunderstanding plotline where one character is not what everyone thinks he is, and then he has to let them all down. Only a few movies have been able to get away with that, such as The Three Amigos and How to Train Your Dragon. But, darn it, Mater and superspy Finn McMissile are just so charming and the script crams in so many clever puns and jokes that the whole thing comes across as pure fun. It’s not trying to make any kind of grand statement the way the first film was with its anticlimax. And even though I could read more into this film as a message movie than the first Cars, it never actually falls into that trap. It’s just a spy movie with oil and international politics as a backdrop for its lighthearted story. The humor is sharper than it was in the first film. Mater is much less annoying and even slightly poignant at times. The film rarely takes itself too seriously and it actually offers a surprise or two at the end. It eliminates, or at least cuts down on, most of what didn’t work in the original, particularly the McQueen stuff. It has the chutzpah to kill Bruce Campbell. Any movie that’s brave enough to do something like that deserves at least a little respect. Basically, this movie made Mater matter to me, and that’s a small miracle. So yeah, I’ll have to see Cars 3 eventually, even though it will probably just make Cars 2 look like even more of a fluke than it already is – the only kind of great one in the series. All images are the copyright of their owner. This entry was posted in Pleasant Surprises and tagged animated films, cars, comedy, films, movie review, movies, pixar, sequels, spy films. Bookmark the permalink. Uh, good on you for finding a silver lining on this movie, but man, I disagree with you on pretty much every point. Cars 2 is just awful. It’s little more than a 2 hour long commercial for a huge roster of new toys. I’ve seen it twice and hope never to see it again. As for Mater, he’s easily one of the most annoying side characters of the last 15 years. Centering the sequel on him makes about as much sense as having Jar Jar Binks play Obi Wan’s part in Star Wars Episode 2. Uggh, there’s another movie I hope never to watch again. For me the humor feel flat and I was annoyed constantly by Mater and the moronic “smart card” who surrounded him. The moral of Cars 2 seems to be that “being dumb is cool”. Anyway, great analysis, but I ain’t convinced. I appreciate your comment. Yeah, I totally understand. It really seems like I should hate this movie, which is why I felt so shocked that it wasn’t absolutely atrocious. I guess it was a step up from the original, which I admit isn’t hard at all. Maybe it’s that I watched with a bunch of kids, but for whatever reason it managed to get past my defenses. Hey Nathan. Got anything else to say other than “hur-dur Cars 2 was just a stupid toy commercial”? Because Lasseter says he got the idea for Cars 2 from his international vacations and he wanted to bring a cultural side to the Cars franchise, which was his favorite out of all the movies Pixar has ever done. Mater annoying? Puh-leeze. He’s a kindhearted simpleton. Patrick Star. Now THAT is an annoying side character who doesn’t even consider other people’s feelings. Obi-Wan is a jackass. I’d rather have Jar Jar replace him as Anakin’s best friend. And Attack of the Clones was a masterpiece. The 2nd best Star Wars film behind A New Hope. The humour may have been flat, but the movie’s message was NEVER “dumb was cool”. It was that “being compassionate is more important than being cool or rich or smart”. Try again, rather than just jumping on the moronic hate bandwagon for this movie.